A year ago I went on a backpacking trip in the Cairngorms, which I described in this post. 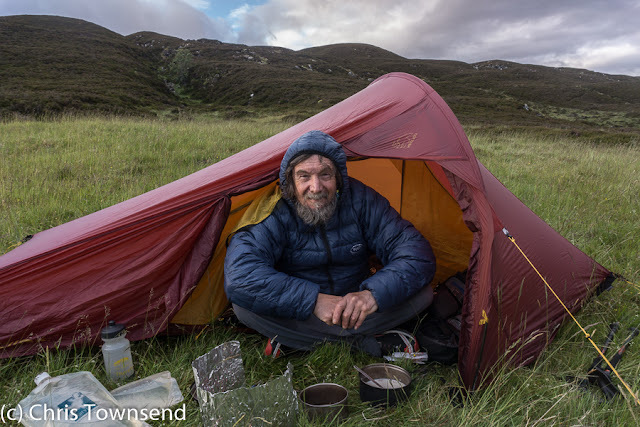 As part of the reason for the trip was to test some ultralight gear I made the whole trip a lightweight one and wrote a feature about it for last September's The Great Outdoors entitled A Lightweight Approach To Big Hills. Here it is complete with rather wonky-looking gear list. Ultralight backpacking is often portrayed as risky and masochistic, as heading into the wilds with barely enough gear to survive and certainly not enough to be comfortable. It doesn’t have to be like that. I don’t go into the hills to practice ‘surviving’ or to suffer. I go to enjoy myself. But part of that enjoyment is having as light a load as possible. How light depends on the time of year and the destination. The key factors for combining comfort and safety with a light load are the right gear for the time and place and the skills to use that gear in the severest conditions that could occur. Whilst equipment testing means I’m often carrying gear that is heavier than is strictly necessary I always try and keep the weight down. An opportunity to really do that came in June when Peter Elliott of PHD suggested a trip to try out some new ultralight down items. That was an ideal chance to really see how light I could get my load for a two-night, three-day trip in the Cairngorms. The forecast was for cooler than average temperatures with highs around 15°C and lows of 4°C plus a brisk westerly wind, frequent showers and little chance of sunshine. Good conditions in fact for seeing just how an ultralight setup performed. What weight constitutes ‘ultralight’ or ‘lightweight’ though? I don’t think you can or should put a figure on it. Aiming for a target weight could mean omitting something essential or taking something too light for the conditions just to achieve it. Take the lightest items that will do what’s needed and that fits the definition in my opinion. I also think there’s a difference between the weight of essential gear and any optional extras such as reading matter, cameras and other non-backpacking items. Reduce the weight of essentials and you can carry more of the extras! I can’t imagine going without camera gear, notebook and e-reader or paperback under any circumstances. 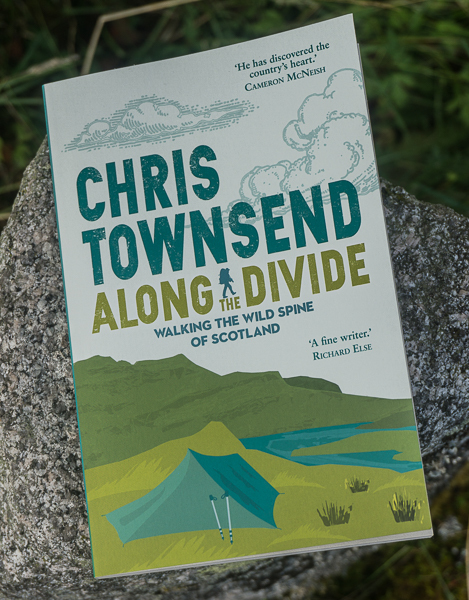 So to keep the weight of a backpacking load low the weight of essential items is the key, especially the weight of the big items – pack, shelter, sleeping bag, sleeping mat. 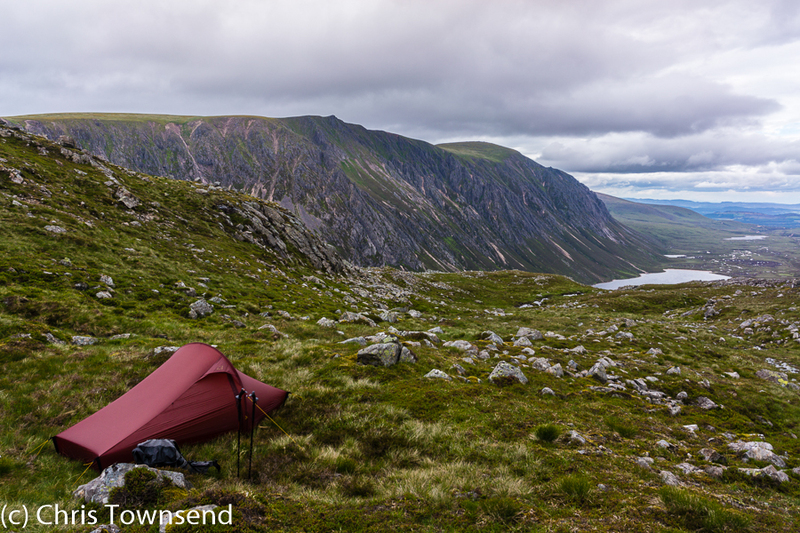 For this trip I looked at the lightest gear suitable for summer backpacking in the Cairngorms with high level camps. I ended up with a total weight of 9.65kg, of which 6.7kg were essentials. Around 3kg of non-essentials may seem excessive but 2kg of that was camera gear, not essential for backpacking but essential for my work. Subtracting items worn or carried (footwear, clothing, poles, cameras) the weight of my pack came to 5.9kg, to which I added 1.5kg of food so it was 7.4kg at the start. Everything performed well and I had a comfortable trip. Heavier gear wouldn’t have added anything except more weight to carry. With such a light load a pack with a frame and thickly padded back, shoulder straps and hipbelt was unnecessary. 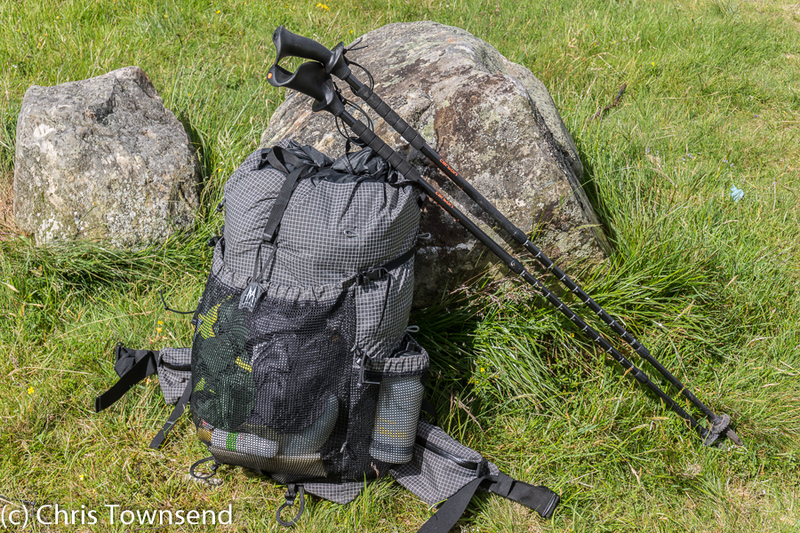 The Mountain Laurel Designs Exodus is a 535 gram ultralight pack made from tough Dyneema fabric. It has useful stretch outside pockets and a total capacity of 57 litres – more than enough for this trip as I didn’t fill it. It’s designed for loads up to 11kg so I was nowhere near pushing its limits. The Exodus doesn’t have any padding in the back so I used the OMM thin foam DuoMat for this. The trip involved much rough pathless terrain and quite a bit of ascent and descent. The Exodus was stable and comfortable throughout. Much as I like tarps they’re not a good choice in midge season even with a netting inner. I like a tent so I can zip it shut and cook in the porch if necessary. I also like enough room for comfort if trapped inside by midges or storms. One of the lightest suitable tents for this is the Nordisk Telemark 2 ULW, which weighs less than a kilo (with better pegs than those provided and extra guylines the weight was 994 grams) yet is spacious for one (it’s designed to sleep two though that would be a tight sqeeze). The Telemark 2 is also surprisingly storm resistant. It easily stood up to heavy rain on both nights and strong winds on the second one. The PHD gear I was testing consisted of ultralight clothing and sleeping bag designed to be used together. 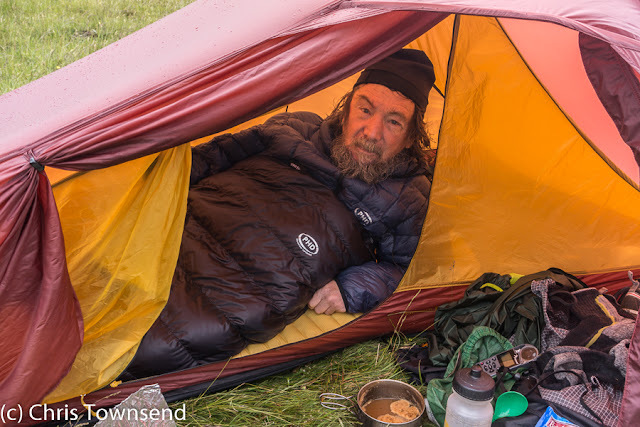 I usually take a sleeping bag adequate for the average temperatures expected, reckoning on sleeping in clothes on any unusually chilly nights. That’s mainly because I’ve never found much clothing other than base layers to be that comfortable to sleep in due to stiff fabrics, zips, buttons, buckles, pockets and other features. However for this trip I used the PHD Ultra K down bag, which has a lower temperature rating of +8°C, plus the ultralight Wafer K series down jacket, trousers and socks. The clothing has minimal features and the fabrics are very soft so it’s comfortable to sleep in. The first night the temperature fell to +7°C in the tent and I was just warm enough in the sleeping bag alone. I did wake a few times feeling a touch chilly though so the second night I slept in the down socks, trousers and jacket. The temperature fell to +6 and I was very warm and cosy, not waking once. I was also very comfortable and it was nice to be able to emerge from the sleeping bag and not be hit by cold air (though that does wake you up!). PHD says that the Ultra K bag plus Wafer clothing should be warm enough down to +3°. I reckon it would keep me warm a few degrees lower. The total weight of sleeping bag and clothing was only 775 grams. For comfort as much as warmth I slept on the shortest NeoAir XLite air bed, which weighs just 230 grams. This ironed out stony and rough ground and made for a more comfortable night’s sleep. Because it’s so short I put the 135 gram OMM thin foam DuoMat under my feet. The DuoMat also made a good sitmat and back padding for my pack. Even in summer hot food and drink can be welcome in the British climate. A warm meal before a cool night and a hot mug of tea or coffee first thing on a rainy morning can be very restorative. So I always carry a stove. 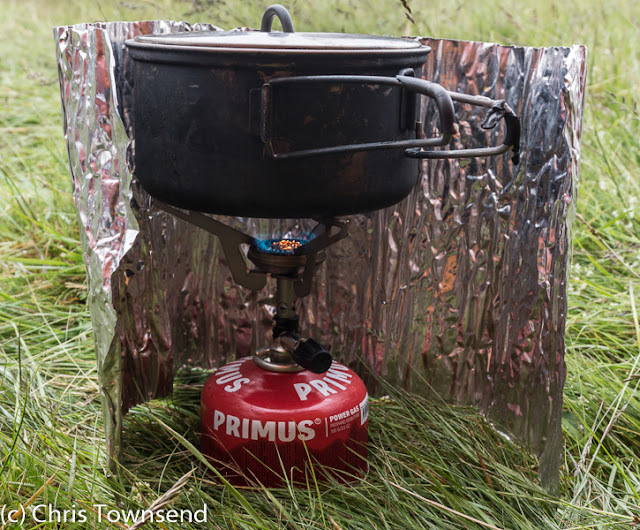 For this trip I chose a tiny 70 gram Primus Express TI gas stove. As it was only a two-night trip I knew the smallest cartridge, the 100 size, would provide enough fuel. There was just a little left at the end of the trip, maybe enough to boil a mug of water. As gas stoves don’t work well in the wind I also took a light foil windscreen. My pots were my 25 year old 900ml Evernew and 700ml MSR titanium ones – combined weight 220 grams. The smaller pot doubled as a mug. Other utensils – spoons, dish cloth, lighters – weighed 97 grams and I had three water bottles totalling 199 grams. The bottles had a combined capacity of 2.7 litres, enough for the whole time in camp, which meant I didn’t have to don shell clothing and footwear to go and collect water when it was raining. If there’s one item that should come top of the list when cutting weight it’s footwear. The old adage a pound on the feet equals five in the pack has been proven true in studies. Long ago I discovered it for myself when I found that I was more comfortable carrying my heavy boots in my pack than carrying them (I walked in running shoes brought for camp and town wear). 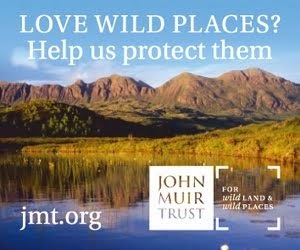 I haven’t worn boots, even light ones, on a long walk for many years. On this trip I wore the 702 gram Altra Lone Peak 2.0 running shoes that I’d worn on the TGO Challenge in May as I knew that they were comfortable and fine on rough terrain. They were wet much of the time, due to the rain and sodden ground, but that didn’t bother me as my feet stayed warm and comfortable in Darn Tough wool-rich socks. My clothing was light, comfortable, fast wicking and fast drying. As the weather was mostly breezy I wore the 168 gram Arc’teryx Squamish Hoody windproof jacket over a 165 gram Rab MeCo long-sleeved base layer much of the time. Salomon Wayfayrer stretch nylon pants (292 grams) kept my legs warm and dried quickly in showers. It wasn’t a trip for shorts. A few times when the wind was strong and cold I walked in the 224 gram Berghaus Hypertherm Hoody insulated jacket, which I took instead of a thin fleece as it’s warmer, windproof and weighs no more. Most of the rain fell when we were in camp but there were occasional showers during the second day during which I wore the Berghaus Hyper Hydroshell jacket, a minimalist waterproof jacket that weighs just 98 grams and which kept the rain out and didn’t get very damp inside. I also took an old pair of GoLite waterproof overtrousers as they’re still the lightest I have at 110 grams, though I never wore them. For camp I had the PHD down Wafer K series garments, which kept me very warm in and out of the tent. At 246 grams for the jacket, 151 grams for the trousers, and 50 grams for the socks they are astonishingly light for the warmth. Other essential items – headlamp (tiny Petzl e-lite), sunscreen, insect repellent, first aid kit etc - totalled 1 kg. I could probably have cut this down a little by paring away at the contents of the first aid, repair and wash kits but frankly I didn’t think the couple of hundred grams I might have saved was worth the time spent doing so – I know some ultralighters will be horrified by this! 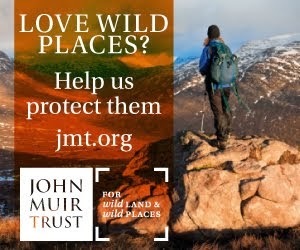 They’d probably also be horrified at my 535 gram Pacerpoles, the only items I carried that couldn’t be described as lightweight never mind ultralight. I find them so comfortable and efficient I never leave them behind however.